Dennis Wierzbicki/USA TODAY Sports Russell Westbrook is averaging 27.4 points, 8.3 assists and 7.1 rebounds per game this season. Oklahoma City guard Russell Westbrook has been on a tear this season. 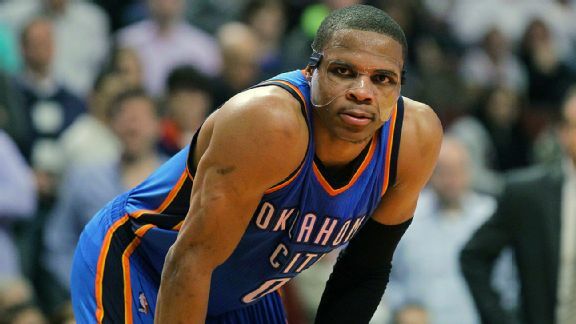 Even after he fractured his cheekbone after taking an inadvertent knee to the face, Westbrook returned to the court a few days later unfazed -- and with some new face gear. 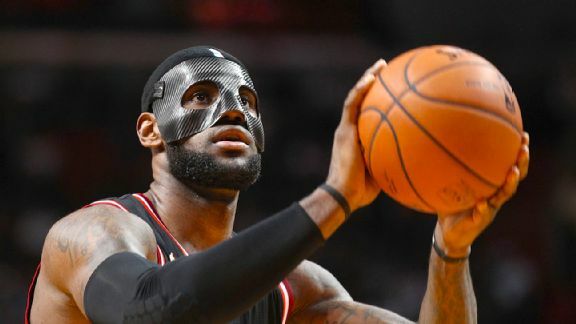 In 2014, LeBron's black carbon-fiber mask was a hit among fans, but the NBA requested he wear a clear mask to protect his then-broken nose. Even so, LeBron managed to be LeBron, scoring 31 points on 13-of-19 shooting in a game Feb. 27 against the New York Knicks. 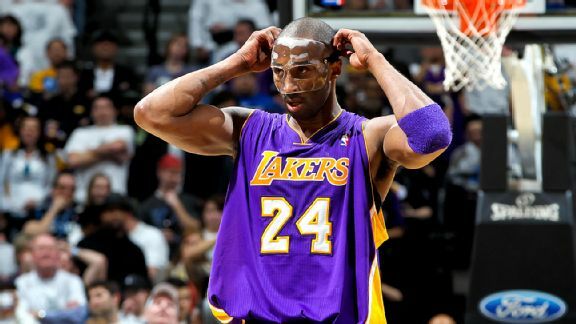 Mask or no mask, Kobe is going to score. 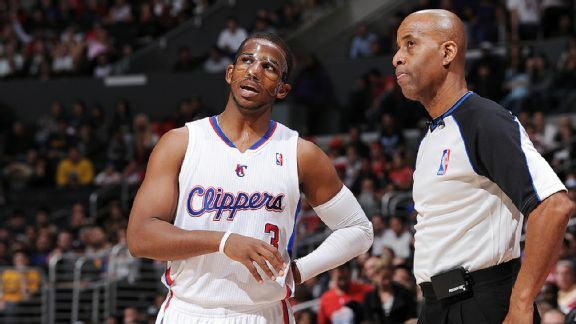 But with the mask, he put up 38 points and eight rebounds in a game against the Sacramento Kings on March 2, 2012. 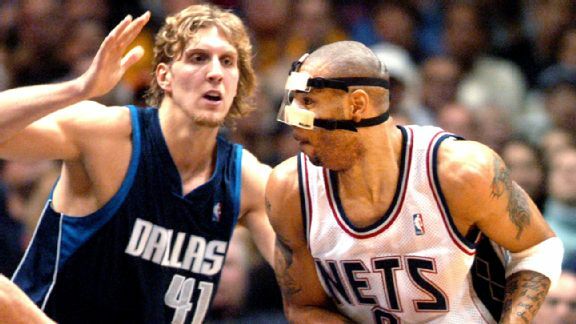 After being elbowed in the nose by San Antonio Spurs guard Danny Green in a game on March 9, 2012, Paul wore a mask for several weeks to protect his face. Hamilton made the mask a thing of his own. 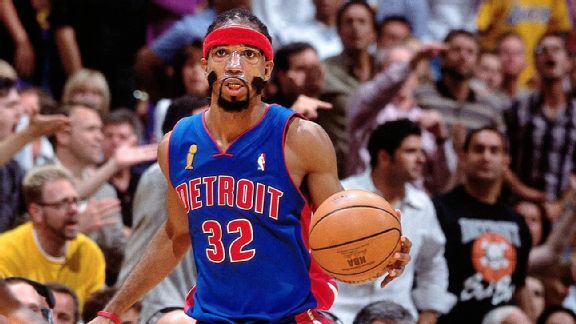 Despite breaking his nose during the 2003-2004 NBA season, Hamilton led the Detroit Pistons' championship team in scoring with 17.6 points per game. Hamilton went on to wear the mask the rest of his career. 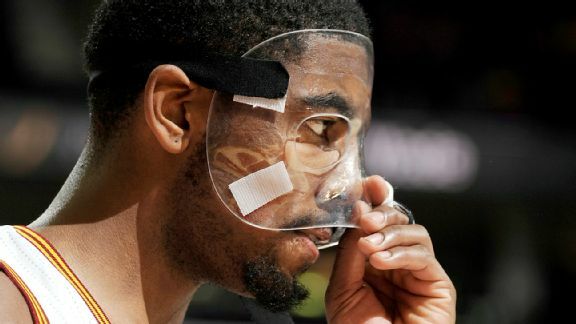 After his jaw was broken, the mask affected Irving in a good way. The Cavaliers' point guard had what was at the time a career-high 41 points, plus five rebounds and five assists against the Knicks on Dec. 15, 2012. 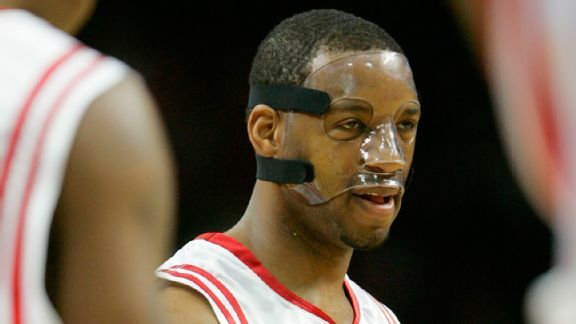 McGrady needed to wear a protective mask in 2006 when he played for the Houston Rockets after taking an accidental elbow to the nose from former NBA player Jake Voskuhl. 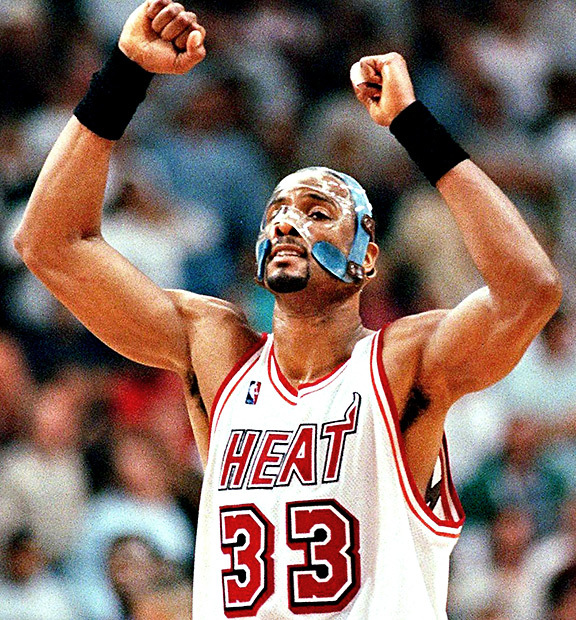 Although it was for a short amount of time, Mourning wore a mask in 1998 to protect his fractured cheekbone. 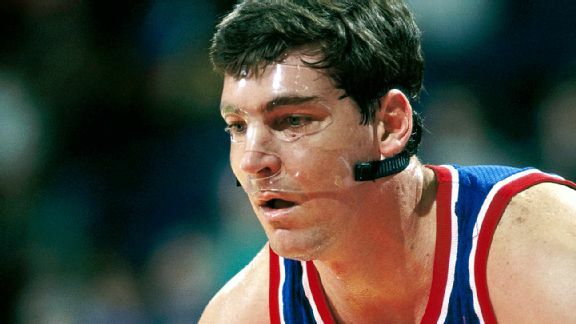 It is fitting that Laimbeer, one of the more physical players in the history of the NBA, needed to wear a mask during his career. 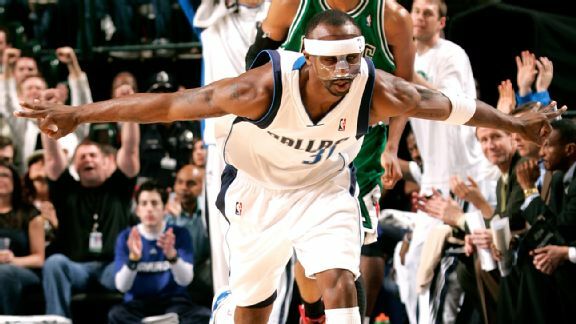 When Jason Terry was a member of the Dallas Mavericks, he had to hop on the runway wearing a protective mask for a stretch of games during the 2009-2010 season. As a member of the Phoenix Suns, Johnson suffered an orbital fracture during a second-round playoff game against the Mavericks. He missed the rest of that series, but returned in Game 3 of the 2005 Western Conference finals against the eventual NBA champion Spurs. 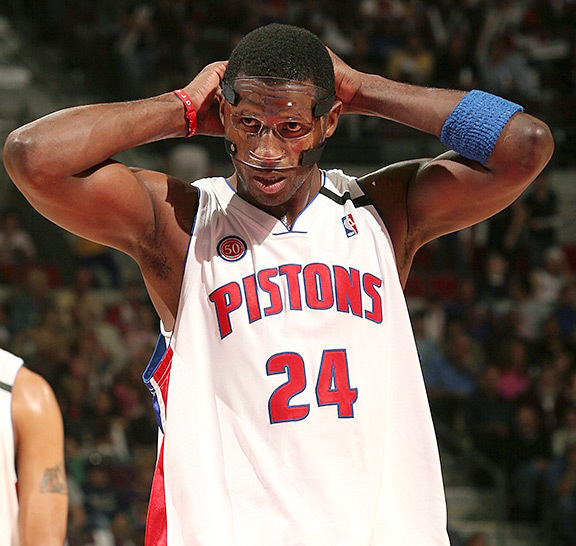 The Pistons had two masked men in 2008 when McDyess joined Hamilton as a result of a broken nose. 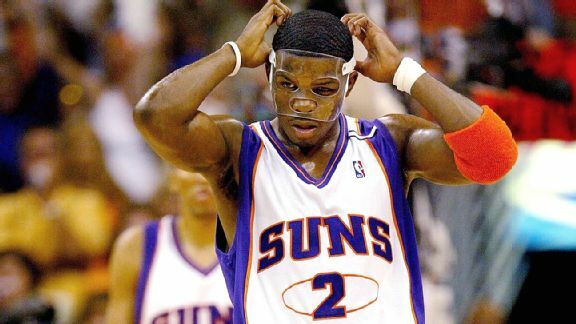 When Martin was playing at an All-Star level in 2002, the forward broke his nose during a game against the Miami Heat, forcing him to protect his face. Henny Ray Abrams/AFP/Getty Images Martin had a long productive career, despite coming out of one of the worst drafts in history. 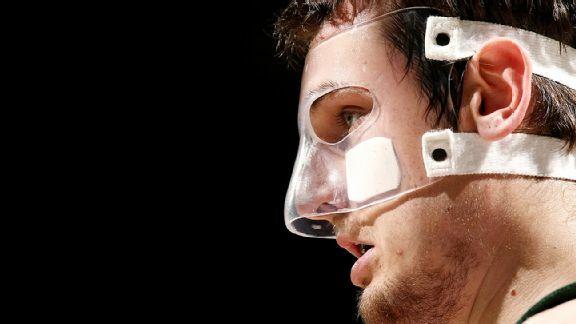 After former Philadelphia 76ers guard Allen Iverson's hand hit Bogut in the face during a game in 2005, Bogut rocked the protective mask for a stretch of games as a member of the Milwaukee Bucks. Broken noses are a theme with protective masks. 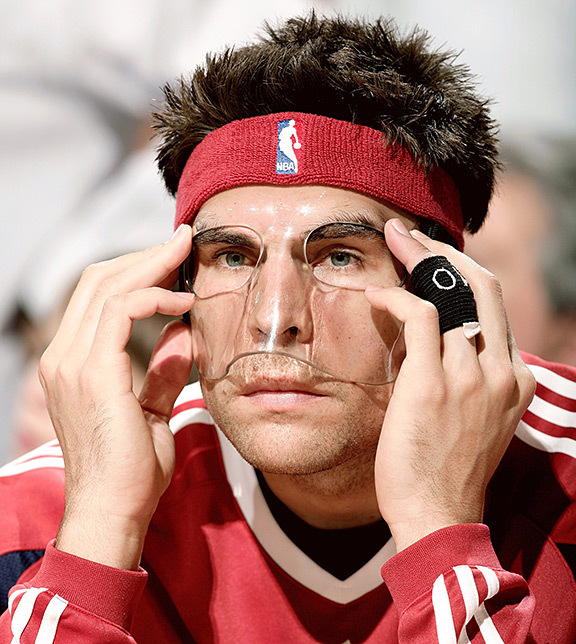 Szczerbiak wore his mask because of one during a 2009 game against the Knicks.